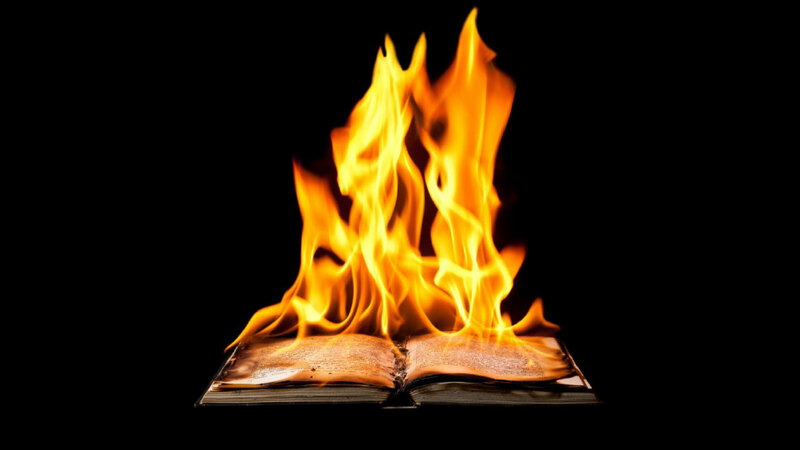 Time to Burn the Book? Many people have attacked the Bible, especially during the past four centuries of Western civilization. Because scholars and scientists have been the main opponents, the validity of the “Book of books” is increasingly doubted. But it was not always so, even when traditional religion was the target. The Protestant Reformation, usually dated 1517–1648, elevated the importance of Scripture and individual conscience by challenging the authority afforded the Roman Catholic Church by its nonbiblical traditions. But then in the 17th and 18th centuries, Enlightenment-era thinkers rejected the Bible where its historical reliability could not be independently verified. For example, they concluded that the Hebrew patriarch Abraham was fictional and that his descendants, the Israelites, were never captive in Egypt. Once Charles Darwin came along, his evolutionary theory further undermined the authority of the Bible, particularly in its account of creation and humanity’s special status. Later 19th-century scholars advanced methods of literary criticism to question the Bible’s coherence. For them the Bible was composed of various strands from different sources, an evolutionary product of human effort. Building on this in our time, so-called minimalists have claimed that nothing more than myth and political agenda underlie the history of early Israel. Their argument includes the idea that the Israelites were never in the Sinai to receive the law from God and did not conquer the land of Canaan, but that this history was the invention of 6th- to 5th-century BCE Jews who returned from exile in Babylon. But not all scholars accept the diminishing of the Bible’s reliability and authority in these ways. When it comes to reliability, the findings of archaeology and the known facts of history cannot be ignored unless one is putting forward an agenda to dismiss the Bible as untrustworthy. Facts are facts. In support of the Bible’s assertion that the children of Israel were a recognized entity in the 13th century BCE there is the witness of the Egyptian king Merneptah’s victory stele. This upright black granite slab with hieroglyphic inscriptions dated at 1208 BCE contains a reference to “Israel” as a people, not as a land. Some minimalist archaeologists have claimed that David and Solomon were just figments of later Israelites’ imagination. Yet within about 150 years of David’s death, the Tel Dan stele and the Mesha stele both mention “the House of David.” Further, a connection between Pharaoh Siamun and Solomon can be reasonably established by a carving celebrating the Egyptian’s victory over certain Canaanites and the corresponding record of 1 Kings 9:16, which states that Pharaoh then made a dowry gift of the city of Gezer to his daughter, Solomon’s wife. Beyond this, there is also the New Testament’s inclusion of eyewitness testimony. Speaking of Jesus’ resurrection, the Gospel writers mention those who saw the risen Christ. Luke writes that after His resurrection Jesus appeared to “the apostles whom He had chosen, to whom He also presented Himself alive after His suffering by many infallible proofs, being seen by them during forty days and speaking of the things pertaining to the kingdom of God” (Acts 1:2–3). The evidence lay in what the apostles saw with their own eyes. They then went out as “witnesses.” Would they have given their lives for something they did not see with their own eyes? In turn Paul mentions that various people saw Christ alive after His crucifixion, and that many were still available and could be cross-questioned (1 Corinthians 15:3–7). This was evidence. Is the Bible reliable despite the doubt cast on it by many in the world around? There is ample evidence to call on for reassurance that we can trust its historical reliability—a stepping-stone to taking its claim to other truths seriously. I’d say it’s time to rescue the book from the fire.